Kenton's Infotainment Scan: About to get impeached? Try news releases and booze! About to get impeached? Try news releases and booze! Richard M. Nixon: "If at first you don't succeed with the media, try booze." Slate's posted an interesting article about PR trying to circumvent journalism, and failing miserably. 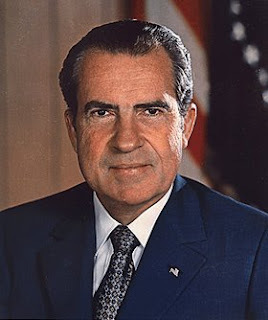 In this case, the "PR" is coming from the master himself, former U.S. President Richard M. Nixon, whose Plan A was to get rid of all that impeachment talk by flooding the press with news releases from other cabinet departments. His Plan B: plying journalists with booze. Now that one is just crazy enough...naw, it didn't work either. Clawson: Just two quick things. No. 1, I am calling all the Cabinet officers to urge them to have their Departments crank out all of the low level legitimate news we can in the next two weeks. I'm sure I don't need to explain … you know why. We just don't seem to be able to get anything into the papers but impeachment. Second, I don't know if you are aware that we have been holding small press sessions in my office in the last few months with about 15 press people, informal gatherings called "Cocktails with Clawson" because we have booze.